This year Purim the rented Nanach pickup truck, with 2 large speakers with up to date music will be circling Monsey NY, making many future Nanachs. 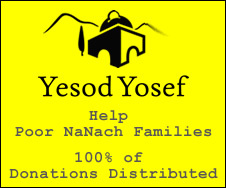 We will be collecting money for the Purim Seudah and Hafatza. Everyone is invited to the open NaNach meal. We do expect more then 75 nanachs to be at this party. The schedule and meal spot will be posted on nanach.net before Purim.